Preheat the oven to 200°C (~390°F). Wash the lemon under hot water, then pad dry. Prepare the leeks: Cut off the dark green ends (can be used for vegetable stock) and remove the outer leaves. Trim roots accurately, to make sure the bulb stays together while braising. Cut in half and rinse thoroughly under cold running water. 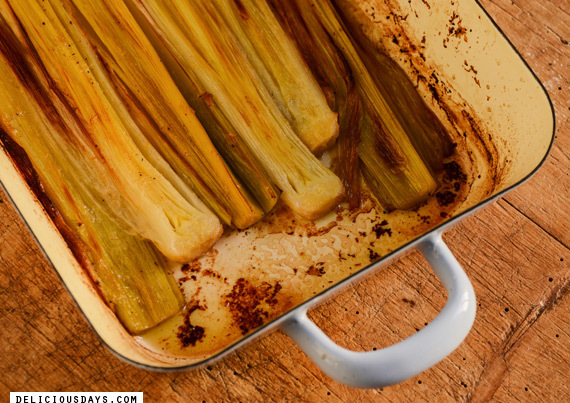 Place the halved leeks cut side down in a pan or gratin dish in a single layer. Sprinkle with sea salt, black pepper, then finely grate the lemon zest directly over the leeks. Next pour the vegetable stock (either hot or cold) over the leeks, it should cover the leeks halfway. Lastly distribute half of the butter in little knobs over the leeks. 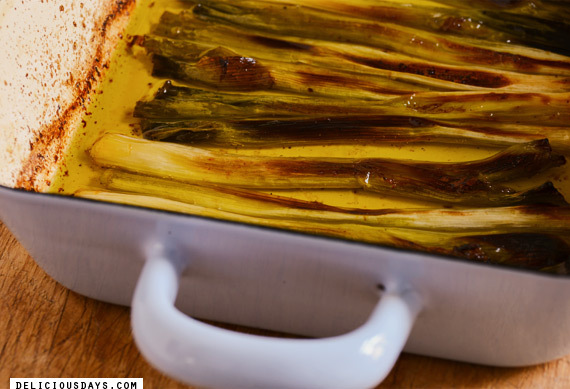 Cover the pan tightly with aluminum foil and braise in the oven (middle level) for 30-40 minutes until tender, turning the leeks once after 15-20 min. Once the leeks are tender you can remove the aluminium foil and discard most of the liquid. Sprinkle with the remaining butter (knobs), drizzle with a little olive oil, then return to the oven and brown nicely with added grill function (watch closely, they burn easily). Meanwhile prepare the chili breadcrumbs: Lightly crush the pine nuts in a pestle and mortar, rip the stale bread into tiny pieces (or use a food processor) and mix both with chili flakes and a little sea salt to taste. Heat a pan, add a little olive oil as well as the nut-bread mix and roast until golden and crisp. Scrape onto kitchen paper. Arrange plates once the leeks are cooled down enough to handle: Peel off separate layers and arrange them like a little bird’s nest. 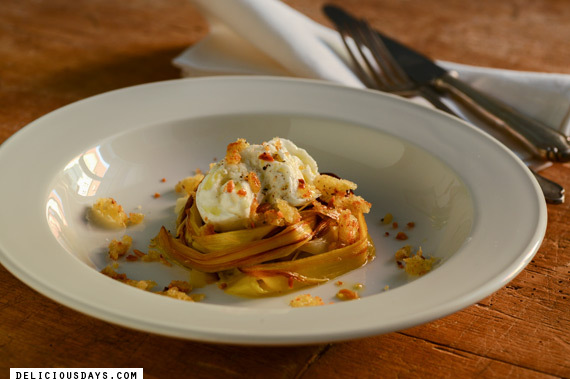 Place a little nut-bread mix in its center, then top with a torn ball of Mozzarella di Bufala. Sprinkle with more nut-bread mix, some freshly ground black pepper and olive oil. Tip: Braised scallions taste equally good(no need to cut them in half), just reduce the cooking time as necessary. Furthermore you can experiment with different braising liquids, e.g. olive oil or white wine work well, too.